Check out some of our promotions for the January series! Skate with us during the Holidays! Despite trailing early in the first half, the Rhinos pulled out a win over the Cheyenne Stampede in their first game of the Western States Shootout. Click to see the Rhinos' schedule and more info about the showcase. Jonah Pearson won the draw, won the puck behind the net, then won the game, tipping in the game-winning goal 1:59 into overtime to give the El Paso Rhinos their first series sweep of the season, edging Tulsa, 3-2, Sunday. Connor Beaudet scored twice and the El Paso Rhinos doubled the Tulsa Junior Oilers, 6-3, Saturday to earn their fourth-straight win — their longest win streak of the season. This weekend, the Rhinos are set to take on the Oilers. Click to read all about the match up! Behind much of the great success the team has had stands head coach Cory Herman. Petr Ceslik scored twice, including the game-winner, and the El Paso Rhinos broke out of their offensive doldrums to beat the Dallas Snipers, 4-1, in front of another packed house at the El Paso Events Center. The Rhinos take on the Snipers for Military Appreciation Weekend! Despite struggling offensively in the first two games in Wichita, the Rhinos notched six goals in the final game of the series to stave off a third straight sweep. Hampus Akesson stopped all 30 shots he faced and the Superior RoughRiders became the first team in the 10-year history of El Paso Rhinos hockey to sweep the Rhinos in the regular season, winning Sunday's game and the series, 3-0. Scott Appleby scored twice including the game-winner in double-overtime and the Superior RoughRiders sent the El Paso Rhinos to their fourth-straight defeat, 5-4, Saturday night at a sold-out El Paso County Events Center. Superior lived up to its Colorado hometown’s name despite being outshot by the hosts, 28-22. This weekend, the Rhinos take on the Superior Roughriders. Download the Rhinos mobile app to keep up with all news in Rhino Country! Marc Zajic scored the game-winning goal on hockey’s equivalent of a passed ball in the third period and, behind the solid goaltending of Erik Spath, the Wichita Junior Thunder made the lead stick; downing the defending Midwest Division champion El Paso Rhinos, 2-1, Sunday afternoon to win the three-game series by the same tally. It was just tricks, no treats, for the El Paso Rhinos on a Halloween Saturday night against the Wichita Junior Thunder. Petr Ceslik and Jonah Pearson each scored twice and the El Paso Rhinos edged out a game Wichita Junior Thunder team to win their home-opener, 7-5. The Rhinos take on the Thunder in the Sun City! The home opener is only days away. Get your tickets now! Click to read about the Rhinos vs. Flyers match up this weekend! Rhino Rewards is back for the 2015-2016 season and you can start collecting points today! It's October and the home opener is right around the corner! Click to read more about the season's deatails. Read about the new Rhinos that will skate in Rhino Country this season. Welcome back defenseman Mack Hollis! Welcome back netminder Ryan "Buttsy" Buttazzoni! This season we're introducing a new club called "The Crash" to help make the players feel at home while in Rhino Country! Join today! Five former Rhinos have returned to the Sun City to play for the UTEP hockey team. Former Rhino defenseman Patrick Gleason joins the UTEP hockey roster. Former Rhino forward Lukas Znosko is now a Miner! Former Rhino forward Jeramy Rezaeepour becomes the third Rhino to choose UTEP. Former Rhino netminder Alek Lazarski will be playing for the Miners this season. Former Rhino Jan Dam will continue his career in orange. Welcome Wisconsin forward Joe Roach! Help us welcome Ruslans Ignatovics! Recap the Run and see the new Spike! The Rhinos welcome a new 17 year old defenseman! Redeem your Rhino Rewards points before the end of August! There's plenty going on in Rhino Country during August! Assistant Coach Nick Gorup answers and gives an in-depth view about the challenges of recruiting. 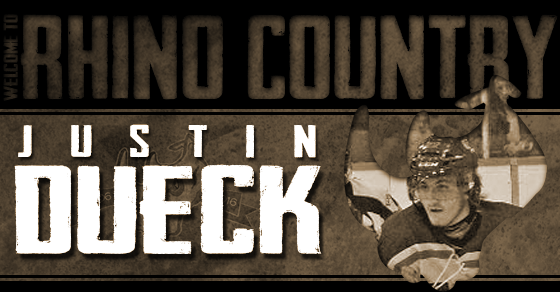 The El Paso Rhinos have announced the signing of 6’1”, 190 lb. forward Kristians Zelts from Riga, Latvia. Click here to see a video of the Rhinos playing hockey out at Lincoln Park. Earn Rhino Rewards points and join us at Biggs Park this afternoon! Over the past two weeks, the El Paso Rhinos visited the Humane Society’s Kids and Critter’s Camp to increase awareness about the endangerment of wild rhinos. Happy Canada Day to our friends north of the 48! Click to learn more about the holiday and read how Coach Herman celebrates. 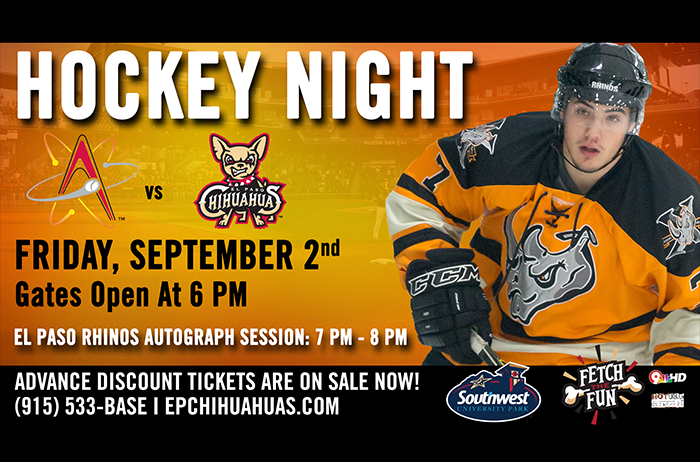 The El Paso Rhinos Help Sponsor Winos for Rhinos Conservation Fundraiser. We took modified the NHL awards and gave them to a few Rhinos. El Paso Rhinos’ Swedish forward Sebastian Borg is heading home after signing with Swedish Division 1 team Vallentuna BK. Read this article about the Rhinos from Réseau Des Sports on www.rds.ca! Take this survey to earn Rhino Rewards points and a chance to win tickets to the home opener! Tickets are $14 and must be purchased at the rink so be sure to call or stop by today! 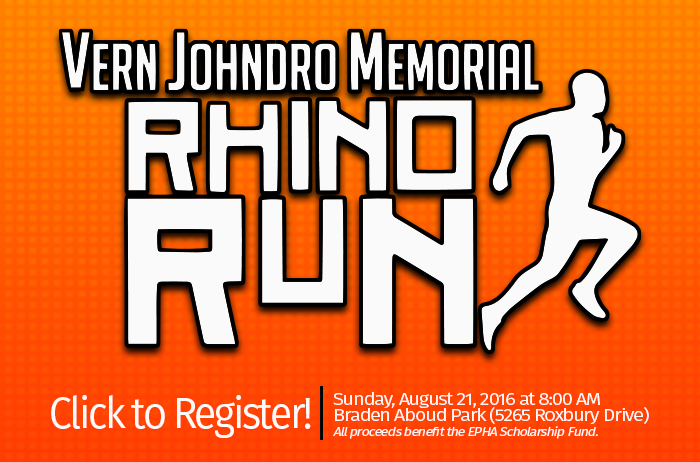 Join us for our 3rd Annual Vern Johndro Memorial Rhino Run on August 22 at Braden Aboud Park! The United Hockey Union (UHU) is proud to announce that the Western States Hockey League (WSHL) will now be competing in North America as a Tier II hockey league in the UHU. To celebrate the franchise's ten year anniversary, every week, we're featuring photos and videos from the past nine years! Rhino Rewards is back for the off-season! The best fans in junior hockey can continue earning points and prizes during the summer. Get your 2015-2016 season tickets today! After a long season together, it was time to find out which roommate knew one of their fellow roommates better. Click to find photos from the first two Thorne Cup games in Rhino Country! Victor Carlsson opened the scoring once again for the Idaho Jr. Steelheads and goalie Austin Althaus stopped 20 of 22 Rhinos shots as Idaho evened the best-of-five Thorne Cup Finals, 1-1, with a 5-2 win Saturday night. Much like last night, the story of the night for Idaho and El Paso was special teams. This time however, it was not in the Rhinos favor. The Rhinos lost the second game of the Thorne Cup Championship Series by a final score of 5-2 to the visiting Idaho Jr. Steelheads. Jiri Pestuka scored the game-winning goal with 10 seconds to play in the second period and goalie Alek Lazarski made it stick, stopping all 22 shots he faced, as the El Paso Rhinos came back from a three-goal deficit to nip the Idaho Jr. Steelheads, 4-3, in Game One of the Thorne Cup Finals. All of the hype became reality on Friday night at the Sierra Providence Events Center. The two best teams in the WSHL put on a show of epic proportions. In round one of this championship fight, the El Paso Rhinos came out on top by a final score of 4-3. We have less than 48 hours until the puck drops at center ice of the Sierra Providence Events Center for the first of two games in El Paso. The two best teams in the Western States Hockey League are preparing to do battle. Here are some more numbers to get you ready for this weekend’s showdown. The Rhinos will start the series at home on April 10 & 11! David Brancik scored the game-winning goal 85 seconds from the end of regulation and the El Paso Rhinos earned an opportunity to hold on to the Thorne Cup with a nail-biting 3-2 win over the Ogden Mustangs Saturday night. The El Paso Rhinos won the Conference Championship over the Ogden Mustangs on Saturday night -- but it took until the very last second to seal the deal. Goaltender Adam Vay stopped 42 of 43 shots and the El Paso Rhinos hung on to defeat the Ogden Mustangs, 2-1, to take a commanding 1-0 lead in the best-of-three Thorne Cup semifinals Friday night. The El Paso Rhinos defeated the Ogden Mustangs in the first game of the Conference Finals on the back of a Gavin Abbott goal five minutes into the third period. The goal was Abbott’s first of the playoffs. Should anyone think special teams aren¹t that important in hockey, the El Paso Rhinos could set you straight. The El Paso Rhinos have secured a berth in the Conference Championship Series following an 8-1 win over the Oklahoma City Blazers. Jeremy Rezaeepour scored a hat trick and the El Paso Rhinos roared back with an 8-2 win over the Oklahoma City Blazers to force a decisive Game Three in the WSHL’s Midwest Division championship series Sunday afternoon. The El Paso Rhinos – who lost 4-3 in overtime on Friday night – scored at will on Saturday to force a Conference Final deciding game three on Sunday. The final score in front of a sold out Sierra Providence Events Center was 8-2. Sam Mancini tapped in a short rebound at the crease for the game-winning power play goal in overtime and the Oklahoma City Blazers edged the El Paso Rhinos, 4-3, to take the pivotal first game of the best-of-three Midwest Division championship series. In order to relax some of the mental strain that comes along with the playoffs, we sat down with a few of the guys to ask some fun questions about their teammates. The Dallas Snipers went toe-to-toe with the defending WSHL champion El Paso Rhinos for 40 minutes, but a disastrous start to the third period doomed the visitors' chances to extend their season. Saturday night’s game was not decided until the third period – but once it was – the win was an emphatic one for the defending Thorne Cup Champions. The Rhinos won on Friday night against the Dallas Snipers by a final score of 6-1. Despite the large amount of goals in the Rhinos favor, the true story was in the play of the El Paso defense. Kendal Craig scored twice and the El Paso Rhinos survived a furious second period rally from the Dallas Snipers to take Game One of the best-of-three Midwest Division semifinals, 6-1. 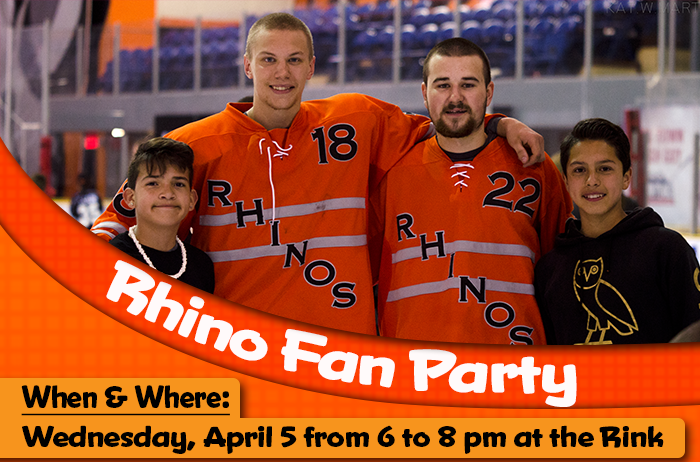 Fans in El Paso have become used to the Rhinos making a playoff run each year when March comes around -- one could say that it has become a bit of a tradition for the team and the city. The Rhinos have a bit of tradition of their own when it comes to the playoffs. The Western States Hockey League playoffs began last weekend. More precisely, the Midwest Division of the WSHL playoffs started last Friday. Toss your teddies after the Rhinos' first goal on March 14! Also, bid on game-worn teddy bear jerseys during the game. Get your playoff tickets now! The first place El Paso Rhinos and division runner-up Oklahoma City Blazers squared off for the final time this regular season on Sunday. Marek Langhammer scored twice and the El Paso Rhinos wrapped up the regular season on a high note, defeating the Oklahoma City Blazers, 5-1, Sunday and winning the series against the Blazers two games to one. Kole Hudson scored twice in the third period, including the game-winner, and the Oklahoma City Blazers earned their third victory over the El Paso Rhinos this season with a 5-4 win in the Events Center Saturday night. The Rhinos needed a little bit of luck on St. Baldrick’s weekend to get past the second place Oklahoma City Blazers. Kendal Craig and Marek Langhammer scored twice and the El Paso Rhinos swept the Dallas Snipers, winning 10-2 Sundayafternoon in front of a sold-out crowd of 1,837 at the Events Center. The Rhinos and Dallas Snipers continued the physical play on Sunday that saw the teams total 81 penalty minutes on Saturday. Unlike Saturday, both teams’ power play units took advantage during the Rhinos 10-2 victory. Kendal Craig, Bryton Tomko and Mitch Cobby each scored twice and the El Paso Rhinos beat the Dallas Snipers at the Events Center Saturday night, 8-2. On Friday night at the Sierra Providence Events Center the El Paso Rhinos defeated the visiting Dallas Snipers by a score of 8-1. The format and dates for the 2015 Thorne Cup Playoffs have been released! The Thorne Cup Finals will differ from years past, as the WSHL has chosen to adopt a more “true” playoff format throughout. Quirarte grew up playing hockey in El Paso – not necessarily known as a “hotbed” of hockey. The organization was a lot smaller then and just like it is today – well coached and tight knit. After being held without a shot in the third period of Saturday’s game, the Rhinos were not going to be stymied on Sunday. The two teams totaled 46 penalty minutes in a game that saw the Rhinos lose 6-4 to the second place Blazers. The top two teams in the Midwest Division met up in Oklahoma City Friday night and it was the first place Rhinos who came up with a shutout. Lukas Znosko notched a hat trick and goalie Ryan Buttazzoni earned his second shutout of the season as the the El Paso Rhinos rolled over the Tulsa Junior Oilers, 16-0, to sweep the three-game series Sunday in front of another sell-out crowd of 1,837 at the Events Center. Different goalie – same story. Goaltender Ryan Buttazzoni stopped all 11 shots by the Jr. Oilers on Sunday afternoon to give the Rhinos a 16-0 victory. Jiri Pestuka scored and assisted on two Rhinos goals just 10 seconds apart and El Paso goaltender Adam Vay stopped all 11 Tulsa shots he faced as the Rhinos shut down the Junior Oilers, 5-0, Saturday night. On Saturday night at the Sierra Providence Events Center, the El Paso Rhinos topped the Tulsa Jr. Oilers for the second straight night. Lukas Znosko scored twice to open and close the scoring in the second period and the El Paso Rhinos rallied to beat the Tulsa Junior Oilers, 7-1, to open the teams’ three-game series Friday night. Once the Rhinos began to shoot from distance and through traffic, the floodgates opened. Although six-year-old Colton has been diagnosed with Down Syndrome and Leukemia, he hasn't slowed down for a second! Because his condition requires such expensive treatment, the Rhinos have joined Team Colton in a fundraising effort. Help Colton by donating or simply sharing his story. The El Paso Rhinos Junior A team will be participating in their 5th St. Baldrick’s Event. The team, including the coaching and training staff, stick boys, and other Rhino members, will once again be putting their heads’ up for bid! The El Paso Rhinos closed out their three game set in Tulsa with a 10-2 victory over the Jr. Oilers on Sunday morning. For the seventeenth time this season, the Rhinos won on the road – this time by a final score of 7-1. The Oilers managed only 11 shots on the night and Buttazzoni put up his second shutout in only six starts this season. 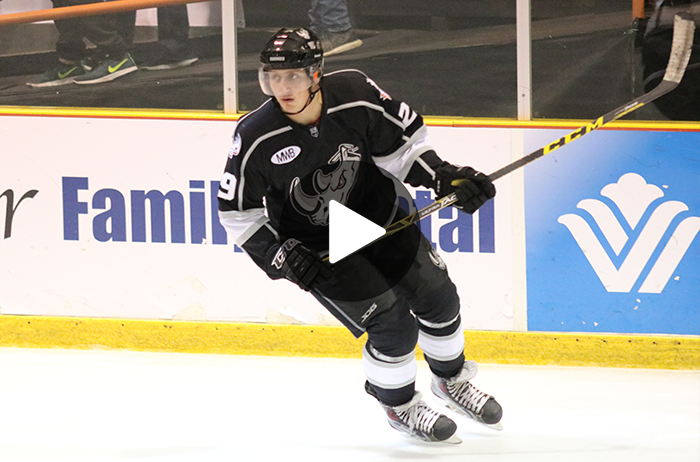 David Barbour and Jiri Pestuka each scored twice and the El Paso Rhinos swept the persistent Springfield Express with a 6-1 win in the third game of the series Sunday. Jiri Pestuka and Patrik Stancl each scored twice and the El Paso Rhinos skated by the Springfield Express, 7-2, in the second game of the teams’ triple-header. Goaltender Adam Vay stopped all 17 shots he faced and Kendal Craig scored twice as the El Paso Rhinos shut out the Springfield Express, 5-0, Friday night to open a three-game series in the Events Center. The Rhinos scored three goals in the second period to pull away from the Springfield Express and clinch a 5-0 win. El Paso Rhinos' Marek Langhammer scored 4:19 into overtime to beat Wichita Jr. Thunder, 6-5 (OT). Update the app to receive notifications for team news, game updates and more! Before we bring in the new year, check out some of our favorite goals from the latter half of 2015! See what some of the players are planning for the Holidays! Hang out with the players one last time before the 2014-2015 season comes to a close. Support your Rhinos in McCall, Idaho as they play to defend the Thorne Cup! 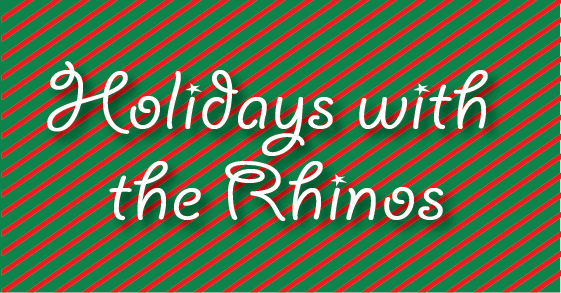 Cheer your Rhinos on from Rhino Country as they take on the Steelheads in Idaho!